https://matcha-jp.com/en/1658 Aomori's Stove Train: This Winter Trip Will Warm Your Body And Soul! Stove train is a unique train running only during the winter months in Aomori prefecture. In today's article we'll tell you all about the attractive features of stove train and how to buy tickets for this special experience. Today we introduce Aomori prefecture's stove train operated by Tsugaru Railways. As you keep warm by the heat of the potbelly stove on board the train, you can enjoy looking out at the beautiful, snow covered scenery. Limited to the winter season, this is a deluxe experience that's a real treat for the senses. Every year from December 1st until March 31st, the stove train runs between Tsugaru Goshogawara Station and Tsugaru Nakasato Station. 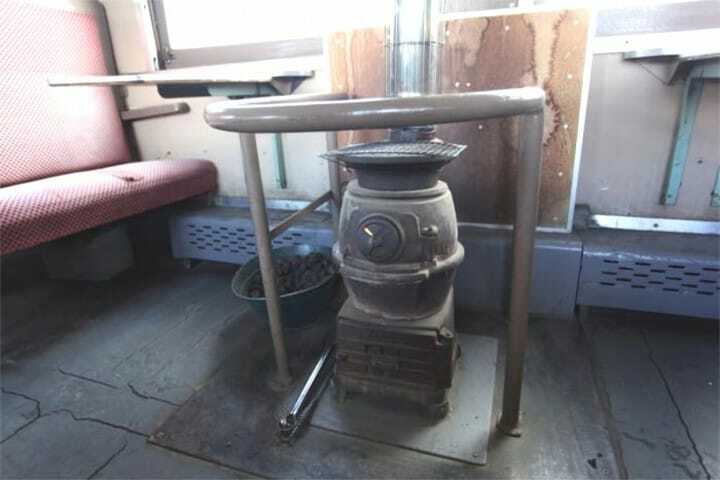 The inside of the train is kept warm courtesy of a coal operated daruma stove, so the train has come to be known as the stove train. By the way, a daruma stove refers to a cast iron stove that was used from the Meiji period up to and including the Showa period. It's called a daruma stove because it resembles the shape of a daruma, a Japanese doll considered to be a good luck talisman. Eat Grilled Squid-An Experience Limited to Stove Trains! If you have a chance to take a ride, how about challenging yourself to an experience limited to stove trains? Namely, cooking surume on a stove-top grill aboard the train! Surume is dried squid and cuttlefish. It has an extremely chewy texture, and the more you chew, the more the flavor starts to ooze out. In Japan it's popular as a snack, or as an accompaniment to beer and other alcohol. You can buy the dried squid on board the train for 300 yen, and right after you make your purchase they'll grill it for you. All the squid sold on the train were caught in the waters off Aomori prefecture. When the squid is grilled, the excess moisture evaporates and the flavor becomes even more concentrated. A host of other good qualities also emerge with this grilling process, including a fragrant aroma and improved texture. When the squid is grilled over an open flame it has a tendency to scorch and burn, but this isn't the case when it's grilled over the daruma stove. In addition to the surume squid, a tasty treat called dorayaki (*1) is also sold on board for 150 yen each. *1 Dorayaki: A popular Japanese snack in which anko, or azuki red bean paste is sandwiched between two pancake-like pieces of baked dough. Right in front of you, the conductor will add more coal to the fire when the flames inside the stove start to die down. If you take a quick peek, you can see the flames burning brightly inside the stove. Even if you're not sitting very close to the stove, you can feel its warmth just by looking at the fire inside. In order to ride the stove train, it's necessary to purchase a special stove train ticket in addition to the regular train fare (400 yen in total). Each day there are only three return train trips (*2), so beforehand it's probably a good idea to check the train timetable. Both the regular ticket and the stove train ticket can be purchased at the various train stations, but please note that some stations along the route have no station attendants on staff. In that case, you can purchase your tickets aboard the train. *2: During December, there are 2 trains per day on weekdays, and on Saturdays, Sundays and holidays, there are 3 trains. Passengers can board the stove train at stations where the train stops at, between Tsugaru Goshogawara Station and Tsugaru Nakasato Station. However, please keep in mind that there are some stations along the route where the stove train doesn't stop. Also it's good to know that the stove train is very popular, so when boarding the train part-way along the route, though you'll be able to get on board you might not be able to get a seat. Tsugaru Goshogawara Station is the closest station to Aomori city and Hirosaki city, where many of the accommodation and tourist facilities are located. However, if you travel as far as Tsugaru Nakasato Station, you're actually starting to move away from Aomori city and Hirosaki city. So when you're making your travel plans we recommend taking this into account. Chat with the Conductor and the Other Passengers! As you can see in the above photo, all seats on board the train face each other in pairs. In many instances you'll be sharing the same table with other passengers, so why not take the opportunity to exchange some pleasantries? Not all seats have a stove nearby. However there are two stoves on each train, so if luck is on your side you might get to sit close to one. The train conductor and the vendors selling squid are all friendly and approachable, so if you have any questions about Aomori prefecture or you'd like to know more about the stove train, please don't hesitate to ask them. In addition to the stove train, Tsugaru Railways also operates other seasonal trains such as the furin train in the summer months, and the suzumushi train in the autumn. So passengers get a different perspective depending on the season in which they ride a train. To see Tsugaru Railways during the different seasons, please have a look at their photo gallery. If you have a chance to visit Aomori during the winter season, please be sure to take a ride on the stove train and have a unique experience that only the winter can provide! Meet Thomas and Friends At The Ōigawa Railway Thomas Fair!